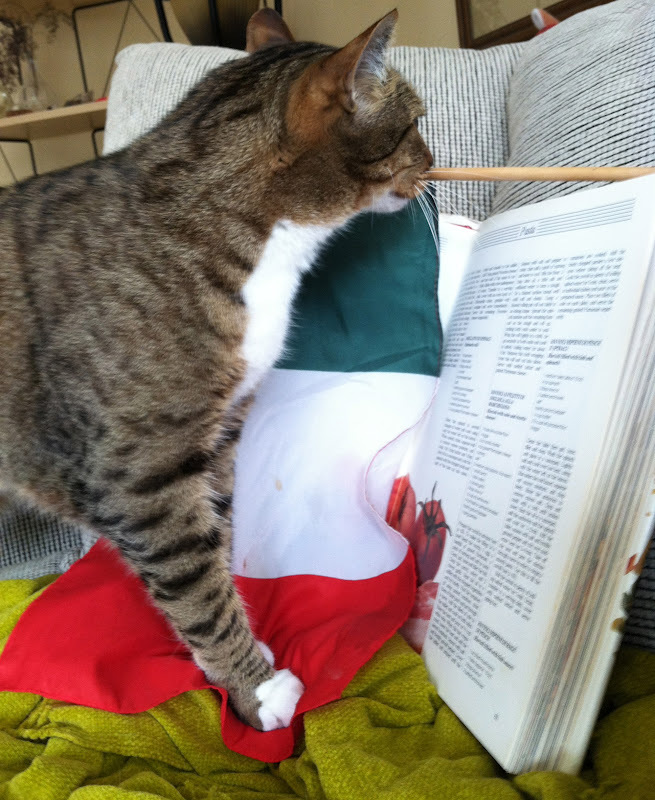 Meowvalous to enjoy the sensational foods of EyeTailYah and I tells ya, nothing more savory than a giganticat sized Italian cookza bookza. Itza important to know what country youza cooking the foods of, so naturally Me & Myself always brings out the EyeTailYun flag as my book mark. 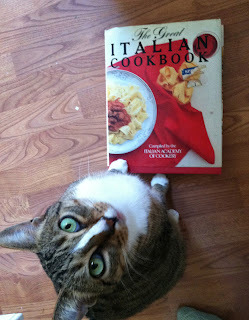 Basta it's Pasta and making my whiskers wiggle! Gotta have a bottle of something in your cucina when youza wondering whatza cooking - can youza see whatza on my Vino Bottle? Holy Cannoli! Itza my favorito authenticat Pizza with the sensayshunal cheese of the Buffalo and the really red tomatoes that I puts my toes into to crush during the Fall crush. Itza never ever too early for the Early Birds tomatoes, oopsatini I means Early Girls tomatoes! Me & Myself been devouring Pizza by the hour since we were inky dinky! Wishing you a nonCATastrophic week and remember, it's the end of September and getting darker earlier so less time to catnap in the sunny rays. That means we gotta speed nap! Catzowey! Everybody izza purrpondering over who to votes for in November's USA Purresidential eeeelekshun. 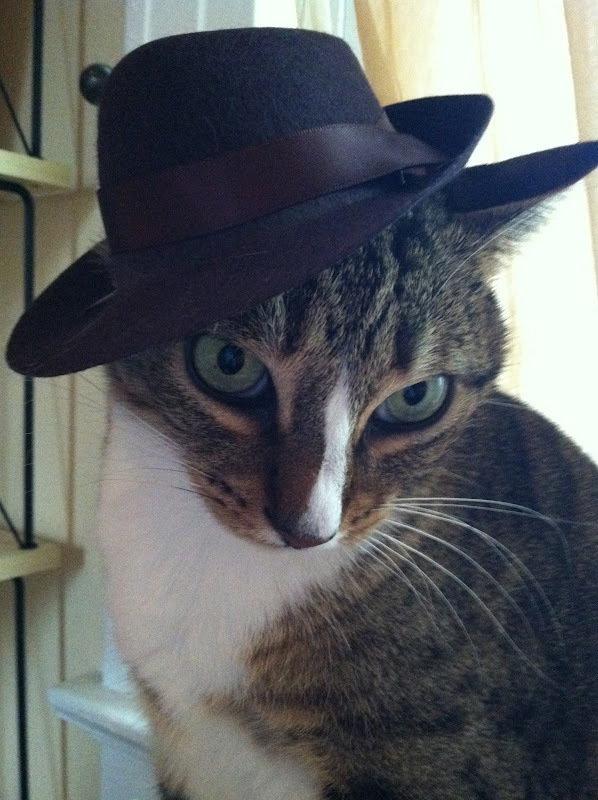 I'm tossing my hat in the ring so how about voting for Me & Myself? Some furiends gonna looks to the left and purrhaps looking for a fine Fillybuster busting out all over election. And some furiends gonna be looking to the right for a mighty tight election. 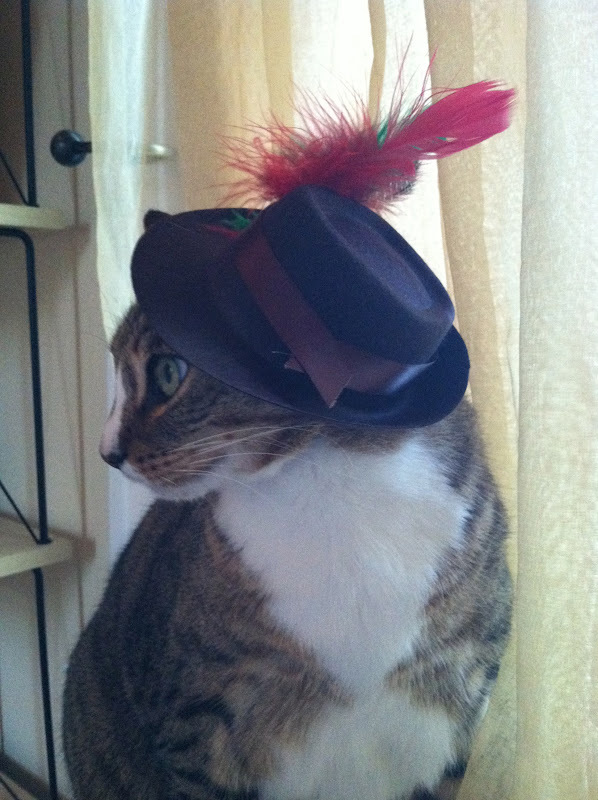 Whatever ring your hat is flung into, youza gotta enjoy the meowment, and I luvs luvs luvs strutting on the catpaign trail in my custom made deeziner hat. Yep uh huh, custom made by ZK CAT COUTURE and this company rocks deezining the bestest ever hats on the Planet. 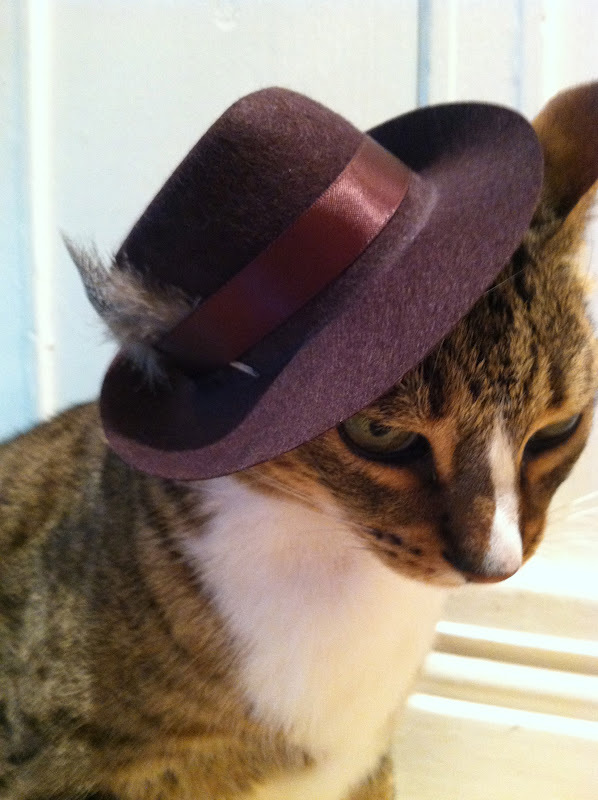 Duzn't matter if youza running for office or going to your Easter purrade, cuz their hats are made for all occassions and for Man Cats and the bella Signorina kitties. 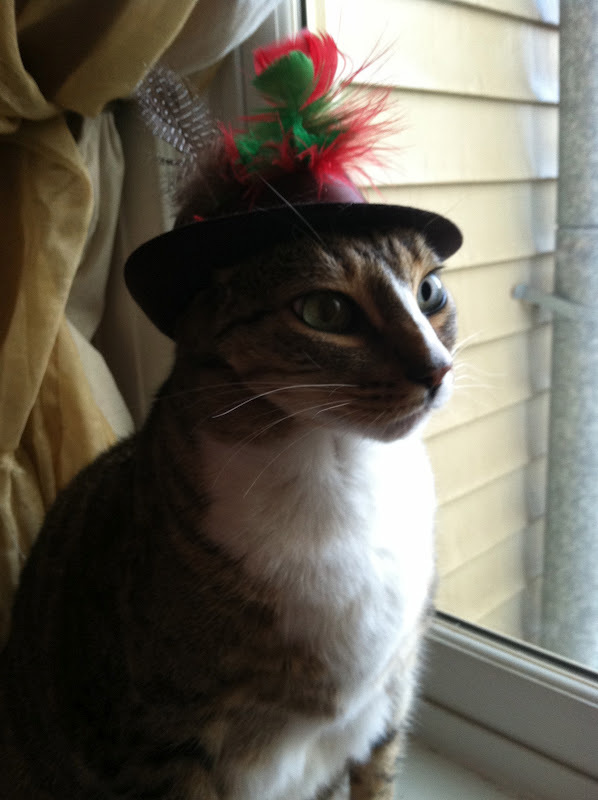 These hats are comfurtable and sturdy 24/7 all of the time. AND the shipping box rocks too! 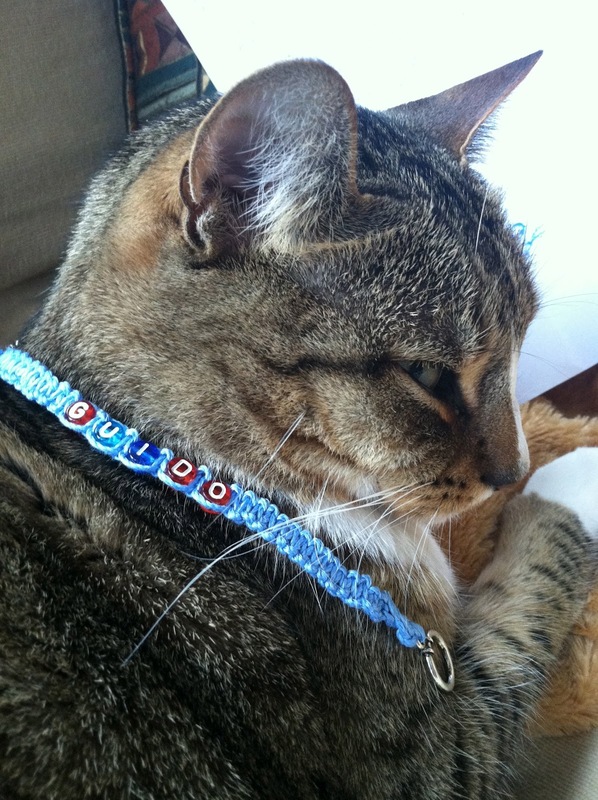 If youza has a passion for fashion, well you gotta order from ZK CAT COUTURE & tell em Guido sended you! 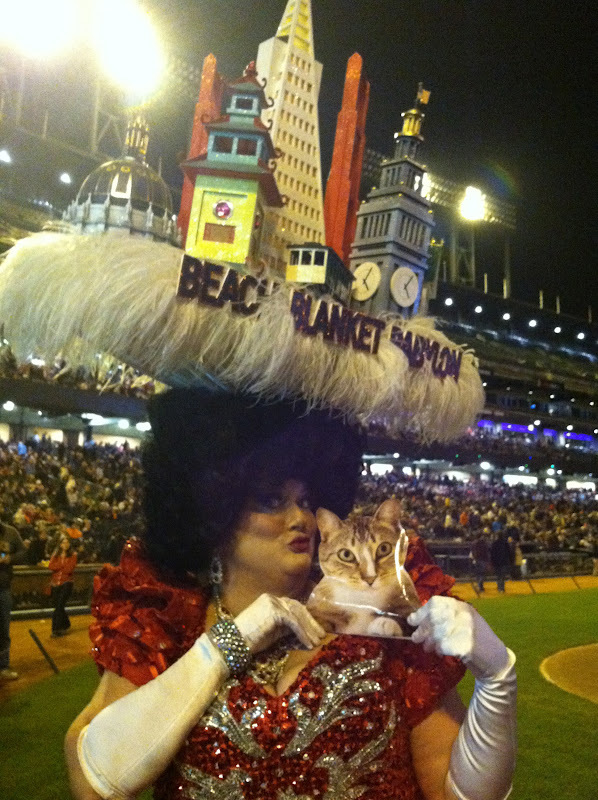 Nothing makes my whiskers wiggle more feline finer than a meowment with my favorito San Franfuncisco Queen of Beach Blanket Babylon whooza holding me and my Purrresidential Candicat-self mighty tighty with her winning hat on her head! Purrhaps I makes her my FURst Lady when I gets elected as PURResident and youza all comes for a slumbercat pawty in the Lincoln Bedroom at my Tidy Whitey House! Falling Into Fall - That's All ! Catzowey! It's the 2nd week of September and time to remember we're almost falling into Fall. Leafs are blushing red and falling all over cuz it's time for Fall. 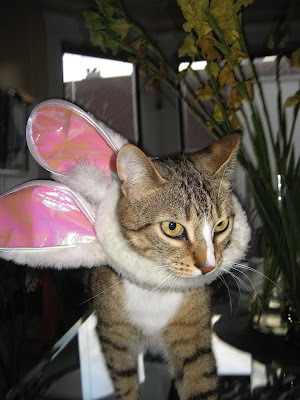 Fur shure, it's pawsible you might fall onto your house guest whooza visiting you and yur house this Fall. 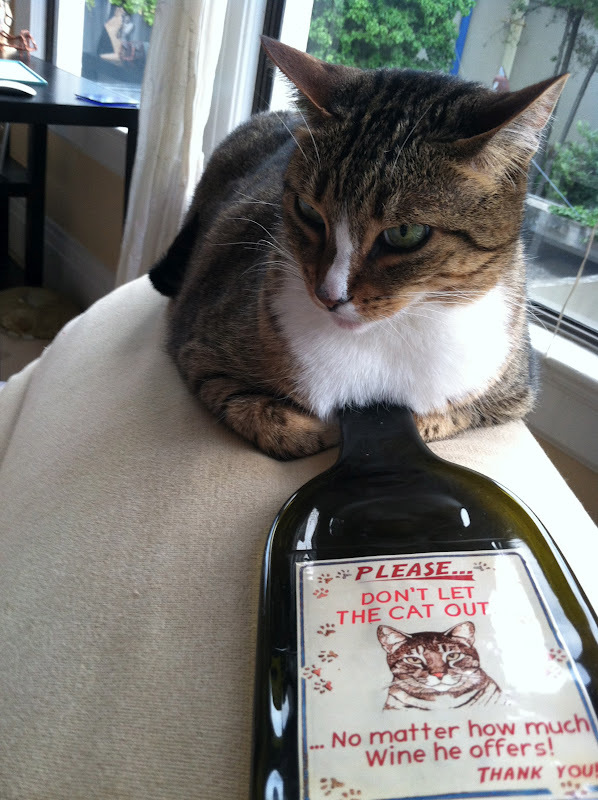 Keep your keen cat eyes on your Fall house guest whooza trying to stand tall and NOT to fall this Fall! Purrrhaps youza feels the urge to fall, so you gotta remember, even if itza not September, always fall onto something comfurtable and cushy! Mostest impurrrtant is to always have your ID on you. Cuz if youza falls in Fall time or Spring time or Sum Sum Summertime and then wakes up and doesn't know who excacticatically you are, youza in trouble if youza without your ID. Then youza cannot get home to that giganticat bowl of Pasghetti & Meatballs cuz youza got Fall Amnesia, and that could cause a tsunami sized hiss fit. Catzowey! 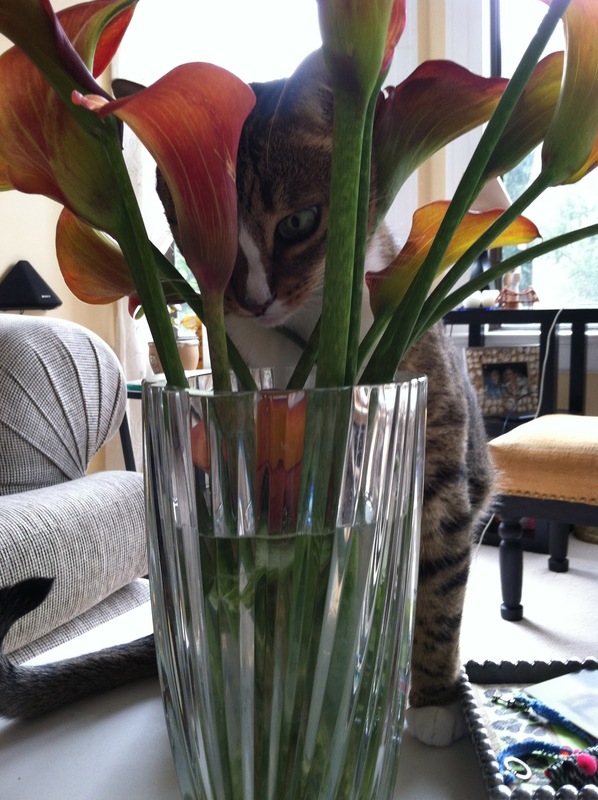 Imagine dat your flowers are in the wrong place and out of pawzishun! It happens without you knowing it happens- yep uh huh it duz! And that's when you want to call in an expurrt extreme floral makeover speshulist to check out the power of your flowers. Always let yur extreme floral makeover speshulist get into and onto the job immediatley. Yep uh huh that's fur shure! 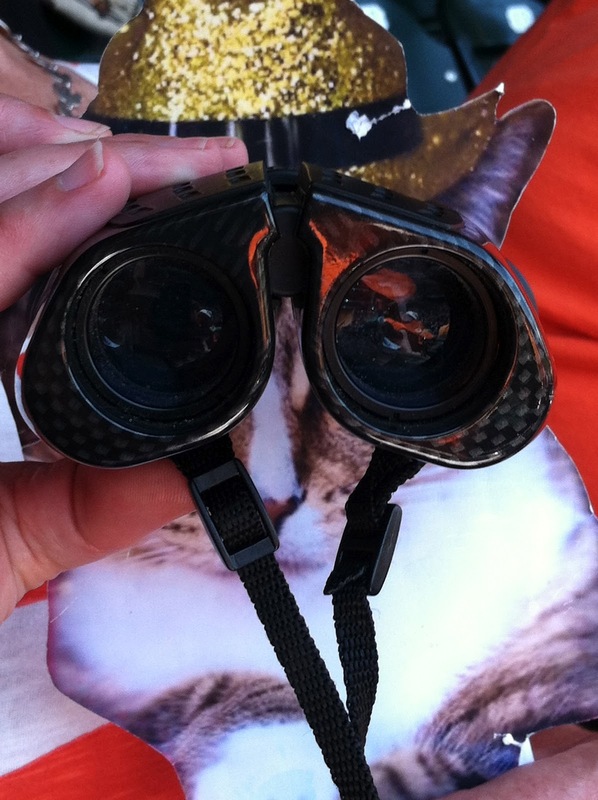 Often Me & Myself needs binoculars to see the extreme florals being made over in the makeover of the moment. 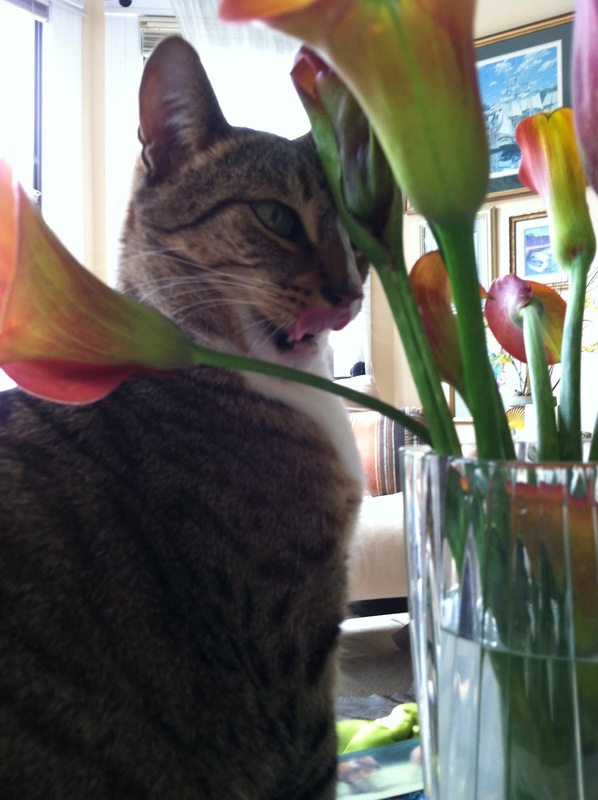 It's the good lick of approval! It's meowvalous to relaxacat a little on the job cuz being an extreme floral makeover speshulists can make ya exhausticatted. It's the first week of September so Me & Myself wants YOU to make it a nonCATastrophic funtastic week to remember.